After our last test session, we weren't comfortable with the pressures and temperatures we were seeing on our unmodified car. We were running Motul 300V 0W20, and pressures were dropping below 5 psi in the pits at the end of the session. Oil temps as reported by the ECU were well over 270°. For today's session, we switched to 300V 5W30 to see if we could keep the hot pressures a little higher. Here's a graph of what we found. 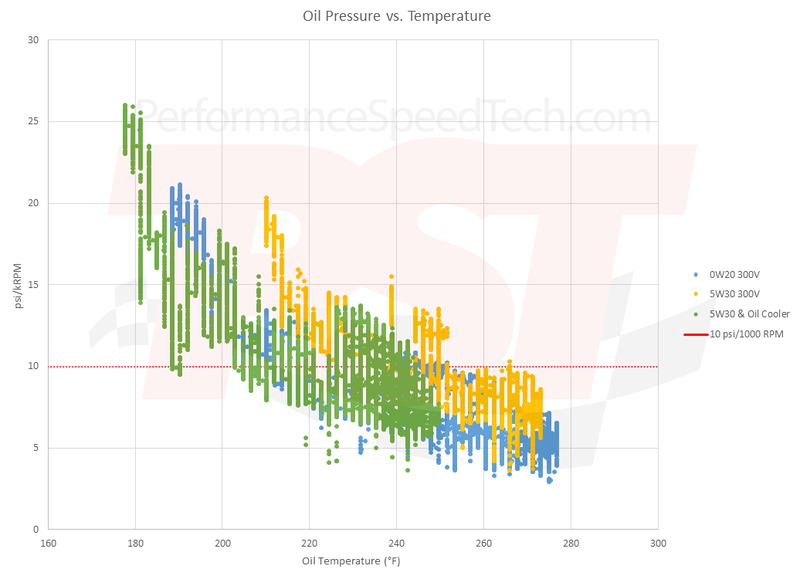 This shows psi per thousand RPM at varying oil temperatures. As we'd expect, the hotter the engine, the thinner the oil. This is normal. The red line is the "safe" goal of 10 psi/thousand RPM. That's not an especially scientific value, just something to compare as "good/bad." RPM values below 1000 RPM were excluded to get data from only when the car was actually moving. We're not interested in heat soak right now, just on-track numbers. The blue is the 0W20, and the yellow is the 5W30. 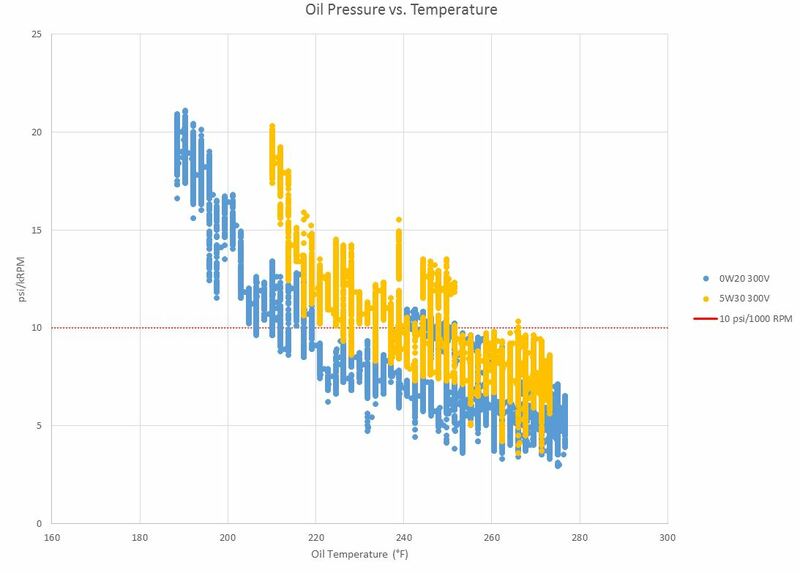 You can see pretty clearly how the 5W30 helped keep oil pressures higher as temperatures increased, but didn't really give us abnormally high pressures at lower temperatures. Both tests were run on track here at the Motorsport Ranch, with ambient temperatures around 85-90F. We may run 5W40 for the next oil change just to see if that moves hot pressures higher, but we think it's safe to say 5W30 is the right call for tracking a relatively unmodified car in hot climates. Anyone have any similar experiences? Here's an updated graph showing the same data and processing, once an oil cooler is added to the system (green series). You can see the oil still behaves as it always has, but it's kept about 30° cooler. Now that we've seen how well it works on our car, we'll definitely be pushing everyone to run an oil cooler if you're tracking your car in the summer. As much as we love doing engine swaps for people, we'd rather not do it because someone spun a bearing from letting their oil degrade. Last edited by GSpeed; 08-30-2015 at 01:11 PM. That is very cool. Thanks for posting. I don't get what the obsession with 0w-20 is around here. The copy of the factory service manual I have clearly states 5w-30 is an option along with 0w-20 and 5w-20. Personally I use Castrol 0w-30 or Mobil1 0w-40 as they can be found locally. Agreed. After seeing this data, we'll recommend 5W30 to all our customers. I was at homestead last week with 90f weather, very humid mind you. How does it relate to your psi/rpm ? 50psi at 5000rpm = 10psi/1000rpm ? I have it on video but no data logger yet. 2013 Scion Frs Track Car - Sold. That sounds about right to me. 255° seems about right for a track car on a hot day with an oil cooler, maybe a little on the hot side. You may gain a little bit by switching to 5W30, but you're probably fine for now. 50psi at 5000 RPM is better than we were able to get without an oil cooler. Definitely very good info thr. I was thinking of switching to 5w30 or 5w40 to prepare it to track days. Guess now I'm definitely going to heavier grade oil. Thanks for posting this info. This plot is an excellent way to present the data. Thank you very much for posting. I'm sold. 5W30 going in this week. Pardon the noobish question but synthetic or non ? Lmao that made my night. Thanks for posting this. Since my car is naturally aspirated with an oil cooler, the highest oil temps I've seen at the track is 225F. Even at these "safe" temps, I'll keep running a mixture of 5w30/5w40 of Motul. I moved to 5w30 Motul 300v and the HKS oil cooler. At a recent trackday at Bedford Autodrome on the GT circuit I saw a maximum oil temp of 107 degrees Celsius, and 18 psi at tickover when returning to paddock. I never pushed the car hard before the modifications because tales of sky-high oil temperatures and <10psi in the paddock scared me a bit. I'm now seeing oil pressures of 125psi when the engine is cold, and this worries me a little too, so I've taken to letting the engine warm a bit before moving off. I guess you can't have it both ends?? Last edited by Uncle Benz; 07-19-2015 at 03:10 PM.